Social landing pages are not the same as regular old landing pages. The idea of sharing content is not a “new” word-of-mouth-marketing (WOMM) concept. But the mechanisms now available to facilitate it are. In this post you’ll learn how to contemporize your landing pages with the latest social media techniques and widgets, and why it’s beneficial to do so. Old-school WOMM relied on people actually talking to one another (gasp) and emailing or IM’ing links to one another. This is all well and good, but it’s primary weakness is that it’s essentially a private conversation and often a one shot deal. You wouldn’t typically send multiple emails about a single promotion to your email list (too spammy) and in-person networking doesn’t provide much patience for promotional marketing. New-school marketing is about leveraging the multiplicative network effects of social media – where people market on your behalf. The blogosphere embraced these notions ages ago (retweet and Like buttons are commonplace) – but marketers have been slow to adopt theses strategies on landing pages. I’ll explore each in detail below, with some tips on how to apply them to your designs and marketing strategy. Familiarity facilitates interaction, so provide sharing mechanisms that people are used to using. You also want to make sure that you take advantage of the right networks. 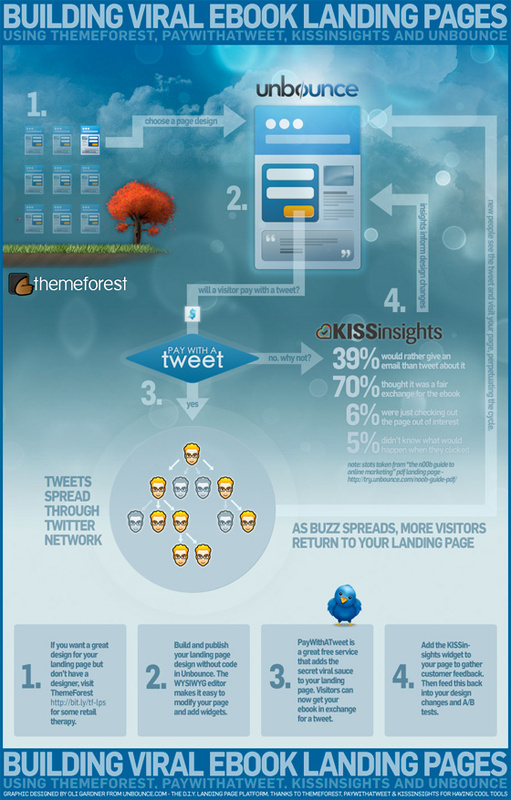 Twitter and Facebook are the most common, and each has different ways for people to share your landing page. Your choice of widget depends on your conversion goals. The like button is what you most often see on blogs. When clicked, it does two things. It adds an entry into your Facebook wall stream, and it increases a counter showing how many people have liked the page – creating social proof. Tip: You can set up any URL you like for the like button. Choose whether to get the temporary exposure for your landing page, or use the opportunity to build the fan base of your company’s Facebook fan page. If you choose the fan page option, the button will show a larger count (as your page is hopefully already somewhat established) and it means that the person clicking it will continue to see your updates in their stream. For better transparency – spell out the intention of the button with a label such as “Like us on Facebook” – where “us” lets them know they are liking your company and not the page. Similarly, the Twitter tweet button lets people share your page with their network – and gives them the opportunity to tailor the message before submission. Unlike the Facebook button, this only works for your current landing page (not a different URL). That’s the easy stuff. We’ll move onto some more advanced concepts later on. Humans are a fundamentally weak species, and just like cows they follow a herd mentality when it comes to decision making. If you’ve ever made a decision about whether to eat at a particular restaurant by looking in the window, you’ll know that a full house means something good. Even more powerful is the scenario where a restaurant is full of patrons of the same nationality as the cuisine – this tells you that the food is authentic and that those who would be most critical of it’s quality (ex-pats) are giving it the thumbs up. That’s social proof. Both of the sharing devices described in rule #1 provide numerical social proof – a count of how many people have said your page (or company) is worthwhile. From an SEO perspective, you can add some numerical social proof to search results pages (SERPs) by implementing the new Google +1 Button. A completely different style of qualitative evidence can be shown through the use of a Twitter Faves Widget. This is the best way I’ve seen to show off a somewhat live stream of social commentary about your brand. Follow these steps to add real and interactive testimonials to your landing page. (They can resonate louder than the old-school text testimonials that often look fake). Now whenever someone visits your landing page they will see a scrolling view of verifiable positive brand commentary. The key here is that it’s verifiable – they can click on the widget to go and view the profile or stream of any of the people saying nice things about you and verify that they are in fact real. Note: To use this effectively, you must be strict and only favorite positive brand mentions. You can no longer use it to keep a record of tweets you find funny or useful for other purposes. It’s a single use feature only at this point. “Unaccustomed as I am to public speaking…” is the cliched start to every persons worst nightmare – standing up and talking in front of an audience. Part of this psychology has filtered through into the sharing of online content (in this case your marketing promotion). Experienced visitors to your page will know how sharing mechanisms work, but for the uninitiated it can actually be intimidating. Click fear might not be as harmful as a peanut allergy, but it can prevent people from sharing. The reason being that they don’t know exactly what will happen when they click the button – will it send a spammy message out onto my personal or professional social stream? Once you Tweet, you can’t retreat. The Internet is horribly permanent (once you put something out there it’s often impossible to erase) and personal and business brand is important to everyone. The more transparent you can be, the more comfortable your visitors will be and the more they’ll trust you. Conversion Tip: Insert a side note beside your sharing widget that states that you will be able to customize any message before it’s shared on your network. Point #4 discusses a real example of this, which should help you understand why some people are hesitant to share. Traditional lead generation requires that you ask your prospects for personal information (such as a name and email address) – usually in exchange for something in return, like an ebook or report. If you have the balls to do it, social lead gen can be an extremely valuable way to extend your reach. I’m calling it social lead gen, but in reality you’re not really gathering leads, you’re gathering brand exposure. It requires more of a long term view and can produce less tangible reporting, but as a viral marketing strategy it’s hard to beat. What is social lead gen? Essentially you are choosing to give your digital assets (the aforementioned ebook etc.) in return for a social favour – sharing/liking/tweeting. This is less intimidating for people as they don’t have to fear that you’ll spam them (as you would be able to do with their email address or phone number). But as I mentioned in tip #3 it is still somewhat intimidating for people to do. I recently wrote a guest post for SEOmoz that included about 15,000 words and a giant infographic (The Noob Guide to Online Marketing). Due to popular demand, I turned it into a PDF and put together a landing page to give it away. I wanted it to be essentially “free”, so I used a service called PayWithATweet.com that lets you set up a button on your page to give away your file in exchange for a tweet or Facebook share (the content of which you can write in advance). I expected that due to the massive amount of “free” content I was giving away that everyone would click it and I’d get a high conversion rate. After all, wasn’t months of my hard work worth a measly tweet? Apparently not as much as I thought. A lot of people were too scared to click. I’ll illustrate it with a couple of examples. The button I used is shown below. Looks great right? But, only 25% of the people that visited the page agreed, and I was hoping for 40-60%. To find out what was going on I added the KISSinsights widget to my landing page to gather some feedback. I’ve since added the side note educating people that they can tailor the tweet before it gets published and it’s jumped to 30% – so it’s getting there. But as cool as this method is, it isn’t for everyone. Lesson learned. Note: I will definitely use this approach again as it did provide a lot of viral brand exposure. It just needs to be tested and optimized using the data I uncovered. A good way to maintain some control over what you want people to tweet, is to use the Tweet This Button, where you can customize the text you want to use and have a URL pointing somewhere (like back to the same page for a viral effect). Another good way to prevent click fear is to offer a preview of what you’re giving away. This could be an example of a previous newsletter, a sample chapter from your ebook, or a link to last months webinar. You can crank the dial another notch by not even asking for that people share your link on their network – thereby making it really free. You will get a LOT more conversions this way – virtually everyone that visits your page will download your content, and the goodwill you establish can encourage people to share it on their network anyway – as a thank you. My advice is to try both methods. You will probably achieve more reach with the tweet exchange method, but you might reach 5x as many people with the free method, which might translate into many more sales down the road. Sometimes you have to believe in your message and just go for it. Great landing pages are highly focused on a single objective. For this reason, you want to minimize the number of interaction points, reducing the risk of diverting or confusing your visitors with too much visual information. If you’re landing page is for lead generation (most are), then you need to be careful where you place your social sharing devices for optimal usage. This is a simple concept. One that anyone who’s dated or played sports can comprehend. In baseball (and dating) terms, you don’t just march directly to second base. Not only is it rude, it’s against the rules. So social landing page rule #5 states, place your social sharing widgets (and other secondary calls to action) on the confirmation page. If you have a confirmation page and your tweet button was on the main page, it’s now lost to the visitor. Your post-conversion page can only be viewed by someone who just agreed to pursue your intended conversion goal (e.g. they just registered for your webinar) – as such they are in some small way “okay” with you interacting with them. This is the ideal time to ask for a favour. It removes clutter from your primary landing page. As we saw earlier, people are often hesitant to share something until they’ve seen it . The antithesis of this strategy is the dreaded exit popup. If the confirmation page is the land of the happy and relevant customer, exit popups are a last ditch attempt to insult people by saying “Surely you are mistaken, you don’t want to leave yet, it’s just getting fun in here.” Really? No. If someone tries to leave your page show some class and let them go. Exit popups are the online equivalent of being asked to donate to charity at the checkout in Safeway. I’m all for doing the right thing (and this technique has raised millions for great causes), but this type of guilt-laden interruption marketing is wholly inappropriate to the context of the situation and should be avoided by any self respecting marketer. Now go and make your landing pages social! If you use these 5 rules, you will be able to improve the social conversion potential of your landing pages, while keeping up with contemporary marketing methods. What techniques have you used to make your landing pages more social? Share your experiences in the comments below.